It’s a strange thing, this food blogging life. If you’re like us, you start out wanting to create some recipes and share food adventures through your blog. Eventually, you start to gain a bit of a following, and those followers start commenting about how they like your recipes, and enjoy reading your blog. And that excites you and pushes you to create even better recipes, and share more food adventures. But then, life happens—work, family, social commitments and, yes, laziness—and you can’t find the time to dream up great recipes to share with readers, and those readers start to move along (though a lot of you have stuck with us through the silence, and we really appreciate it). Of course, a blog post doesn’t have to be long to be interesting, and a recipe doesn’t have to be complicated to be delicious. So with that in mind, here’s a quick look at a pasta dish that I’ve enjoyed for years, but for some reason had never made myself until recently: cacio e pepe. This dish is incredibly simple, and almost insultingly so when you’re paying $12 for it in a restaurant (and yet I’m often guilty of doing just that when I see it on a menu). It’s pasta, pepper, pecorino cheese, and nothing else. Think of it as Italian KD—the nutritional value is minimal, but the flavours are comforting. There are really only two rules here—you must start with whole peppercorns, and you must use freshly grated cheese. Boil a pot of water for the pasta. When the water is boiling, add a whole bunch of salt. 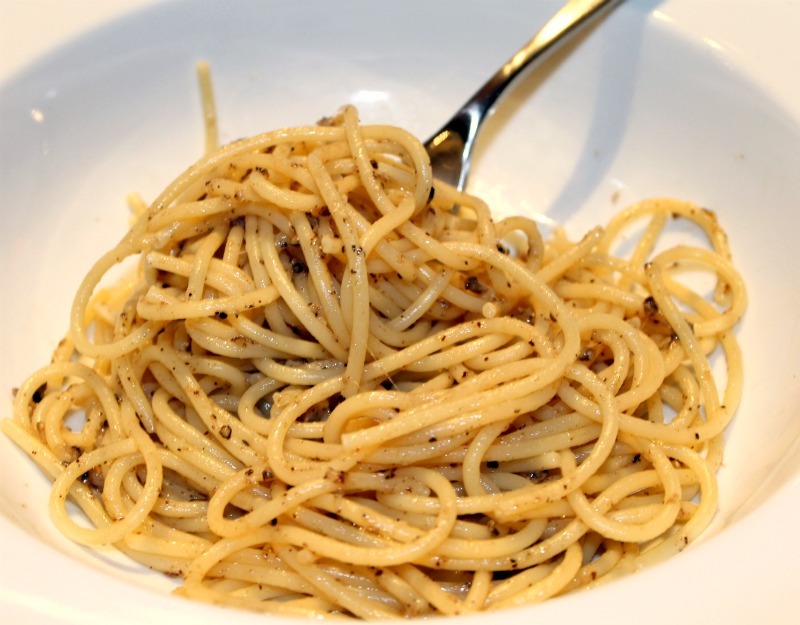 You always want to add a good amount of salt to pasta water, but that’s especially true for cacio e pepe, since salty noodles add to the flavour of the finished dish. Throw in a package of spaghetti and let it cook to al dente. When the pasta is finished cooking, reserve about a half cup of pasta water and drain the noodles. While the noodles are boiling, grind a tablespoon of peppercorns (or more if you like heat!). Even better, break them up with a mortar and pestle, which will crack the peppercorns into irregular sizes. Next, grate a cup of pecorino romano cheese. (You want to finely grate the cheese for this, since a coarser grate can clump when you put together the final dish). You could use parmesan in a pinch, but the salty, earthy bite from the sheep’s milk-based pecorino really makes cacio e pepe what it is. Mix the pepper and cheese together in the same bowl. 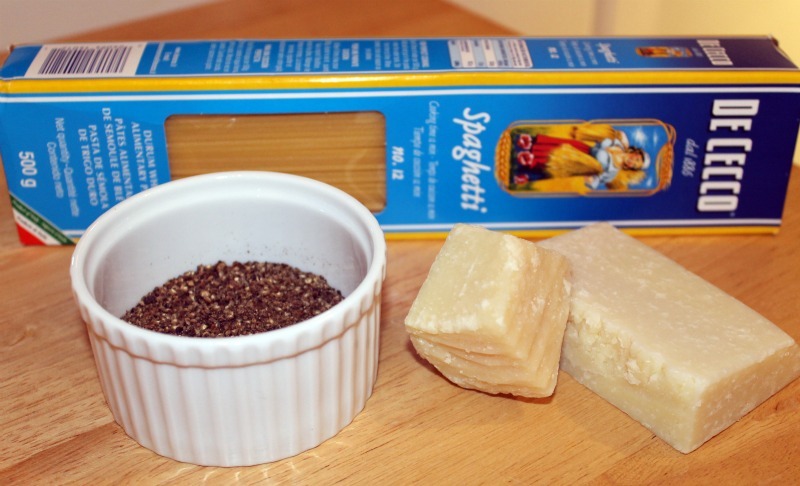 Put the drained noodles back into the pasta pot, and toss with a handful of the pepper-cheese mixture. Add in a couple tablespoons of the pasta water (which will help the pepper and cheese stick, and the starch it retains from boiling the noodles will add creaminess to the sauce), and toss pasta with the rest of the pepper and cheese. Serve as a side dish with meat, as a main with a salad… or on its own, nutritional value be damned.